In this excerpt from his book Real-Time Marketing and PR: How to Instantly Engage Your Market, Connect with Customers, and Create Products that Grow Your Business Now, author David Meerman Scott shows how two very different people–singer Amanda Palmer and HubSpot CEO Brian Halligan–use real-time tools like Twitter and agile software development to get the job done. When she is on the road, Palmer uses Twitter and her blog to bring together groups of fans in real time. “I’ll say, ‘Last minute show at this bar. Everybody show up. It’s free.’ Or ‘Here are the tickets; buy them now.’ ” She calls these instant performances “Ninja Gigs.” Like the morning she tweeted word of a secret gig in Los Angeles: 350 folks showed up five hours later at a warehouse space where she played the piano. Palmer has also done free Webcasts where she auctions off whatever she’s got at hand: props from the videos she’s just shot, handwritten song lyrics, even random stuff from her apartment, like an empty wine bottle. “People have bid hundreds of dollars on this stuff!” she laughs. “But a lot of it is not even really so much about the stuff itself as it is about their willingness to connect with me and support me,” she says. All of these ideas played out in real time for Palmer when she found herself in Reykjavik, Iceland, for what was supposed to be a 45-minute layover on an April 2010 journey from Boston to Glasgow where she was to perform. That was the day Iceland’s Eyjafjallajokull volcano erupted, shooting millions of tons of ash into the air and shutting down air traffic across the Atlantic and Europe. Palmer’s flight was cancelled and her European plans were instantly erased. Facing similar news, with a hotel voucher from the airline in hand, I think most people would just get on the bus and go sulk in the hotel. Not Amanda Palmer. Instead, stuck in Reykjavik, Palmer got on Twitter–and got instant advice from people all over the world. “Hera Hjartardottir (@herasings), the Icelandic singer who’d just opened up for me in New Zealand, hooked me up with her childhood friend. And like magic I scored a ride from a stranger and didn’t have to pack into the sardine bus to the hotel,” she says. “We were friends within minutes.” Palmer saw a few sights, had a refreshing soak in the Blue Lagoon (a natural geothermal spa), and ended up at the hotel in the early evening. She then decided to do a Ninja Gig that night in Reykjavik. “An Icelandic comrade named Ben who had read my Twitter feed volunteered to find me a nightclub and equipment,” she says. The gig was quickly confirmed, and Palmer tweeted the address of the bar and told people to get there at 9 P.M.
Can you believe this woman?! In the morning, she gets dumped at the airport of a strange city–Reykjavik, Iceland, of all places–by a bizarre natural disaster. How random and unexpected is that? Without missing a beat, by nighttime she’s pulled off a gig that would take weeks of planning, even for locals. It takes huge effort to reset the clock of a humongous existing organization like GM to real-time speed. It’s an altogether different challenge to get a startup going at real-time speed from Day 1. Many companies tout their “open-door policies,” but HubSpot has a “no door policy.” There are no offices, even for the CEO. “It feels like there are fewer layers in the organization when anyone can just walk up to you with ideas. You can react to what’s going on right away if you’re not stuck behind a wall with a secretary guarding your door,” Halligan says. When Halligan told me about Agile Scrum software development I got excited. Here were the same principles I’ve been exploring in communication playing out in product development! Just as the traditional method of developing marketing programs takes tons of time, so also does the conventional method of software development. In both disciplines that added time means opportunities are missed. Think about this! How can you move more quickly by empowering people to respond instantly to changes in the marketplace? You’ll have happier employees, too! 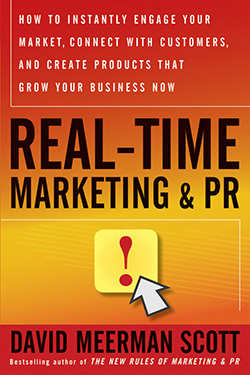 Excerpted with permission of the publisher John Wiley & Sons, Inc. from Real-Time Marketing & PR: How to Instantly Engage Your Market, Connect with Customers, and Create Products that Grow Your Business Now by David Meerman Scott. Copyright (c) 2011 by David Meerman Scott.